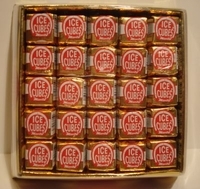 This package of chocolate ice cubes comes in an 100 count box. Cubes of milk chocolate that will melt in your mouth. These are one of the most delicious chocolates around. Cubes of solid milk chocolate that will just melt in your mouth. They are even wrapped in a gold foil wrapper to show their richness. Please keep in mind that these are a very delicate chocolate and melt just like an ice cube. When these are shipping in warm weather they will melt. You may need to add an ice pack or ship air methods.